In November 2014, SMU Central University Libraries (CUL)’ uploaded 611 items into our CUL Digital Collections. CUL now has approximately 41,464 published items. 131 Texas railroad negatives from the Everett L. DeGolyer Jr. Collection of United States Railroad Photographs as part of the TexTreasures FY2015 grant. Images include Atchison, Topeka, and Santa Fe Railway Company locomotives and railroad cars from 1935-1974. Locations include Brownwood, Amarillo, Slaton, Dallas, Cleburne, Plainview, Lamesa, Fort Worth, San Angelo, and El Paso. 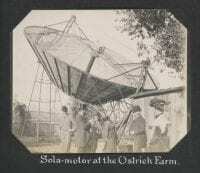 Sola-motor at the Ostrich Farm, 1902. This early example of solar energy was used to irrigate the the ostrich farm, transforming it from a “dry, dusty farm to a lush garden full of flowers.” Source: Solar Resources – The Future of Energy. Tourist album: Mexico, Arizona, California, Colorado and Utah, containing 287 items: 139 items are in U.S. West: Photographs, Manuscripts, and Imprints and 152 items are in Mexico: Photographs, Manuscripts, and Imprints collection. The photographs show markets, silver mining, churches, national parks, and people. Among the locations included are Mexico City, Chapala, Guanajuato, Pikes Peak, Santa Catalina Island, Salt Lake City, and the Cawston Ostrich Farm with a solar power energy dish in Pasadena. Indian Detours: Most Distinctive Motor Cruise Service in the World, ca. 1930s, by the Atchison, Topeka, and Santa Fe Railway Company. 3 pamphlets and 1 book created by Ferrocarriles Nacionales de México (the state-owned railroad company operating from 1938-1998) between 1952-1960. 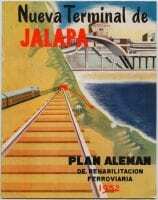 These publications, which describe railroad stations in Ciudad Juarez, Torreón, San Luis Potosi, and Xalapa (Jalapa), are Ferrocarriles Nacionales de México publications, including Instalaciones Ferroviarias de la Terminal de Ciudad Juarez, ‘Puerta de Mexico’, 1960; Torreón, Instalaciones Ferroviarias, 1960; Terminal Ferroviaria de San Luis Potosí, 1958; and Nueva Terminal de Jalapa. Plan Aleman de Rehabilitación Ferroviaria, 1952. 65 shop drawings from the Potter Art Iron Studio Collection from Box 07. Drawings consist of light fixtures, including lamps, hanging lights, pendant lights, and chandeliers. Shown left: [Table Lamp with Branch Design on Red Base and Fleur-de-lis Motif on Shade], 1932, by the Potter Art Iron Studio. 117 items from the George Albert Converse Papers and Photographs, 1861-1897, including two undated notebooks of lectures, notes, and specifications, one of which is authored by George Albert Converse. Also among the items are a stencil of Converse’s name; 28 newspaper articles concerning torpedo boats spanning the 1870s-1880s for publications including The Daily Telegraph and The Times; 9 design drawings and two other illustrations related to torpedoes and torpedo boats; 71 blueprints, ca. 1893-1894; 1 document of Congressional testimony on February 23, 1897, discussing torpedo boat destroyers at a hearing before the Committee on Naval Affairs in the United States Senate; and 1 document on June 7, 1894 explaining broadside pivoted tubes and giving directions for their use at the Torpedo Station in Newport, Rhode Island. This entry was posted in George Converse Papers and Photographs, Mexico photography, Railroads, Texas artists, U.S. West. Bookmark the permalink.